The ARFS 466 Received an ASTM F2656-15 M50 P2 Certification when the system completely arrested a 15,000 lbs truck, traveling 50 mph. The barrier remained intact, stopping the truck only 28" outside of the P1 standard, see movie. 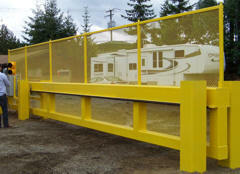 Looking for Security Gates and Barrier Solutions? Ornamental/Anti-Personnel - Suitable for private residences - Small business locations. We provide security hardware to commercial, institutional, industrial, and critical infrastructure projects in the USA and Canada.